This is one of the most popular freshwater pets to be sold in the US. Its beauty has a lot to do with its high demand. This vibrantly colored creature earns its name from the structure of its caudal fins and tails which mimics a crown. The Crowntail betta natural habitat was first found in the shallow rice paddies of Thailand and other similar places in the rest of South-East Asian countries. There are so many positive facts and characteristics that make the Crowntail betta suitable for keeping as a pet. Also, there is one trait or fact about the Crowntail betta that might cause pet owners to change their mind or try to gain experience. And that is the fact that Crowntail betta is aggressive in nature. Sometimes that little fact can be overlooked, especially to seasoned pet owners who know how to handle feisty pets. Overall, the pet is excellent to have. As said earlier The Crowntail betta fish can be found in South Asian nations such as Vietnam, Thailand and so on. The kind of environments in which these beautiful freshwater fish can be found is in rice paddies. In the rice paddies, the water flows slowly, and there is a lot of vegetation. With the vegetation and slow flowing water present, it shows there is a balance if what the Crowntail betta requires is air (due to its labyrinth) and water (for the gills). How big can a Crowntail betta fish get? The size of this fish depends solely on the size of its fins and tails. Since they are the main features of the crowntail betta fish, the fins and tails can grow up to 8-inches which will multiply the natural body size by 3. The healthy body (excluding tails and fins) of a 7 -9 months fully matured Crowntail betta fish is within the range of 2.5 – 3 inches. The Crowntail betta fish can live up to 5 years. If you buy them in some stores where they are kept for years, there is a high possibility of a low life expectancy. The reason is that they were not taken care of properly. Their tanks do not mimic their natural habitat or the water being used to house them is infected. Apart from sickness, they can also be harmed on their own doing. The Crowntail betta is known for a jumpy aggressive behavior. In some cases, they can jump directly out of the fish tank and then to their deaths. That is why store owners blue substance in the Crowntail betta fish’s water, this substance tranquilizes the fish. In the wild, Close to the surface of rice paddies, you will find Crowntail betta fish feeding on several types of insects. Mostly insects that can stay near the shore or insects which needs to a moist environment for their larvae. These insects include grasshopper crickets, flies and so on. The Crowntail betta fish is not necessarily feeding on actual vegetation; it’s more like they feed on insects which include a diet consisting of plants roots. The Crowntail betta is not alone. It is part of a family in which every member has a unique feature (which is the shape of the tail), and they are named according to it. For instance, there is Crowntail betta (due to the crown like nature of its tail), double feathered tail, half moon, half sun and so on. The males have a more vibrant color, and they have a bigger sized tail compared to the females. The fact most bettas possess these features that are specific for males, it means that most pet bettas happen to be male. 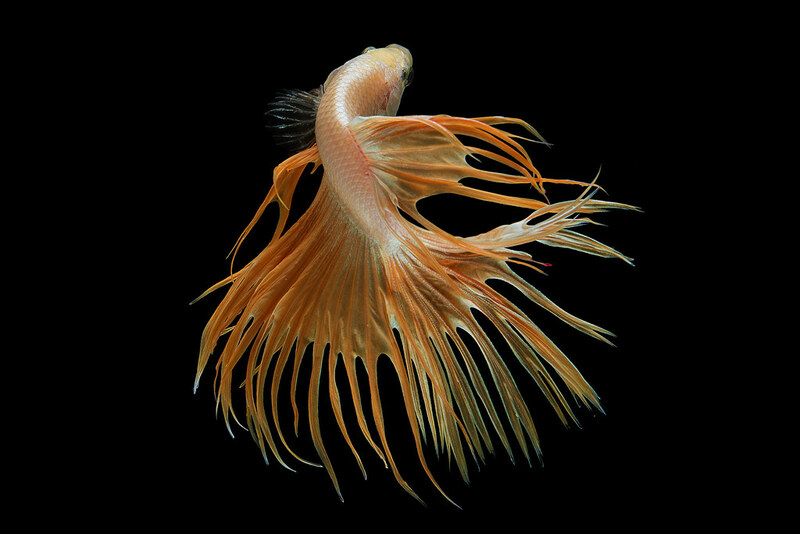 The betta species have a particular organ called the labyrinth. This organ enables the betta fishes to breathe in natural air from the surface. This feature is great for bettas in sure life threating situations. For instance, the betta fishes are known for jumping out of the water, especially in stores. Sometimes they end up jumping out of the tank. If this happens, the fish can make use of its feature which will allow it to breathe for a certain amount of time. Sometimes, enough for a vigilant owner to put it back in its water tank. The bettas also make use of the labyrinth for easy swimming into waters with low oxygen. Like the shallow rice paddies polluted waters or the quiet ponds where water flows exceptionally slowly. Despite having the labyrinth, betta fishes should be put in the appropriate water tank. Not in vases or bad containers with bad water conditions. The betta’s labyrinth is survival feature, not its primary function. It is meant for life threating situations. The male bettas do this action. They build bubbles both instinctively and during mating periods. As the female bettas release their eggs, the male will then gather the eggs with his mouth and then spit them into the bubble nest. After the male bettas build the bubble nest, they keep watch of the eggs until they begin to hatch. The males do not look over their eggs; sometimes the males would chase the female mate from the eggs. This fact makes the Crowntail betta fish quite an exciting pet. They can recognize their owners. They can learn and do tricks for your amusements. For instance, if you put your finger into the betta’s water tank and then move it in circles, the fish will follow it. Also, the betta fishes can swim through hoops. The type of tank to use depends on two things, the species of betta you wish to keep and will their ber mates for the fish to mingle with. A yes to the second one will require you to get a bigger tank. If no then the best will be a 10-gallon tank. If you choose any smaller, you could end up endangering the well-being of the fish. When a 10-gallon tank is in use, make sure to keep changing it for every 2-3 days. The reason is that the smaller the tank, the easier it becomes polluted. When replacing the water make sure to leave a little of the old water, so that some beneficial bacteria won’t go to waste. • And the temperature of the water should be within the range 76 – 80 degree Fahrenheit. As you set up the tank make sure to keep a tab on the temperature of the water. The right temperature will ensure there is good metabolism going on in the Crowntail betta fish. A small deviation from the correct temperature could very well harm the Crowntail betta fish. As little as an increase or decrease by 2 degrees Fahrenheit for from the given range will do a lot of harm. The UV rays or electronic lighting should be dim. To prevent the rays from affecting the temperature of the tank. To make the tank feel more like home, floating plants can be added. The presence of such plants will be beneficial. Not just in making the tank feel more natural, but also help to encourage the male Crowntail betta to build water bubble nests. The substrate to use can be any of these options – fine sand or gravel. If your budget or preference does not permit it, then you can choose to apply nothing. But to make it feel more like the Crowntail betta Habitat, a substrate should be added. The best will be the fine sand as it causes less harm to the fish. Given that the Crowntail betta is a very aggressive freshwater fish, it will be hard for it to have mates in the tank with it. The Crowntail betta fish are so aggressive that they are usually put in a tank or small container with both water and a tranquilizing liquid in stores. For the pet owner to make use of a tranquilizing liquid shows how caution he/she is n handling the aggressive Crowntail betta fish. Despite its aggressive and territorial nature, it still needs to socialize and mate. They need a community that is tolerant of the Crowntail betta aggressiveness. When considering mates for your pet Crowntail betta fish, the first rule is, prevent overcrowding your tank. The reason is that the Crowntail betta fish are very territorial. Why would you put lots of mates in the tank, you were to put mates they would have to be in schools of 2 or 3. Another thing to consider is to prevent putting more than one made in the tank as it could lead to deathmatch where there is only one winner. And the prize is the female mates available. When choosing a mate that best suits the Crowntail betta fish, you can select them according to the stratus in which the fish swims in the tank. The Crowntail betta usually swims around the middle and upper stratus, the best choices for a suitable tank mate is one that generally swims at the bottom. Also, the behavior of the possible fish tank mate should be taken into account. A peaceful bottom swimmer will be the best choice of a tank mate to consider. You can even include another betta. Note – before you introducing a mate, put it in a small plastic bag filled with water. And then place that bag into the tank of your pet Crowntail betta. Keep it in the bag for about 30 mins while you observe whether the Crowntail betta is aggressive towards the fish or not. If it is aggressive, then it is a definite no, the Crowntail betta can’t live with that potential fish mate. The Crowntail betta will show its aggression by puffing its gills. The level of care for feeding Crowntail betta can be moderate or high. Generally, the bettas are omnivorous, but the Crowntail betta is carnivorous. Requires much protein in food to survive. When feeding, try to give in small portions for 2 – 3 times a day. Prevent overfeeding them because they possess a small stomach. To be safe on the amount of food to be eaten, make sure to feed them 2 minutes’ worth of food for some time in each feeding session. Overfeeding your pet Crowntail betta can lead to disruption of its nitrogen cycle which will end up making your pet fish sick and constipated. In the end, it could die as constipation is more like a deal sealer for betta species due to their delicate small stomachs. • Make sure both the male and female are both up to 14 months of age, that way they will be large enough, especially for the females. They need to be large in order to accommodate the eggs. • Take your time to find the appropriate mate for the male Crowntail betta. See if it is less aggressive towards the female mate. This can take quite a lot of time. It is the reason why the breeding process is long. How do you know when the male is ready for mating? As said earlier, the male Crowntail betta instinctually makes bubble nests for the eggs to be housed. Sometimes they make does bubble nests even without a mate present this can be a clear indication that male is ready to mate. Also, it can mean your pet male Crowntail betta is healthy. That’s all the basic things you need to know the freshwater beauty called the Crowntail Betta. Its aggressive nature does not prevent it from being the most demanded in the US. The Crowntail betta possesses features that help it in the wild or captivity. It is beautiful, a fighter and a survivor. Traits like these make them suitable for keeping as pets and selling for a monetary gain. Overall this is an excellent pet for everyone, even first-time pet owners.